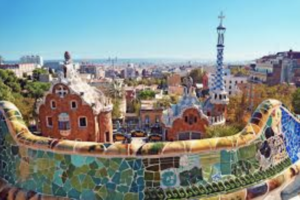 Touring Barcelona: What to do after dreamOlé! A must visit is Sagrada Familia, Gaudi church still under construction an expiatory temple, a must see with each side entrance explaining Jesus’ life, each tower represents an evangelist, another one being Maria and the large in the centre Jesus. If you are about at lunch time why not visit “100% organic” on “avinguda gaudi”, you can find it at north of the church is easily recognisable for two oak barrels right outside. Then take a classic walk from “Plaça Catalunya” (Catalonia square), through the “las ramblas” until the Christopher Columbus statue, where you will reach the port (plenty of nice restaurants!). I like Shoko (right next to the sea) cool for dinners asian fusion and turns into a club. Being by the seaside you are close to Barceloneta, highly recommended by a Celiac friend http://sweetceliac.com/informal/#more-2213 (that’s her Celiac friendly foodie blog if you need more). And if you want typical paella, any restaurant underneath (sea front) the ‘Museo Maritimo’ will be good. Oh, if you are around north rambla catalunya there is the “cerveceria catalana” on the corner of Mallorca street, there is a great place to eat, big queues normal but delicious! They do “montaditos” which is basically a slice of baguette with ‘things on top’, but delicious things on top, from croquettes to crab salad or brie with cranberries, yum! 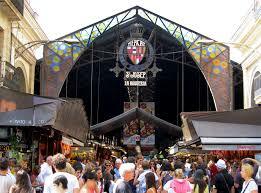 If you are visiting the Cathedral in Barcelona and it is lunch time please go to “Santa Caterina market” they have a restaurant attached to it, all the food is fresh straight from the market to your plate and it is mixed cuisines so you can pick and choose dishes from several places. The Park Guell which was designed by Gaudi for Guell family. They wanted to create an exclusive estate but somehow the project never came to completion and now it is a great sculptured garden to visit. A bit far from the rest but worth going to if you have time. Bear in mind the bus stop is quite far, and then 5-10 min walk up hill, but well worth the views over Barcelona! 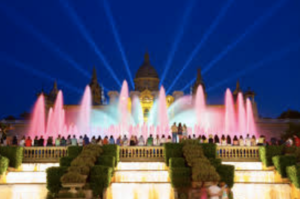 Another great place to go is the “plaça espanya, montjuic” some nights they do “fountain colour spectacle” a magical sight, and is right next door from where we are hosting dreamOle this year. An easy option to visit the city is to take the tourist bus, there are different lines, the blue and red are “must see’s”, the third I think is the green line but not much on it. It’s a great way to see the city for a short visit with so much to do, connections are quite frequent and very easy to follow. Then my favourite museum is MACBA contemporary art, love it, between las ramblas raval and Pelayo street. If G&T is your thing, there is a gin tonic place with more than 20 different types called Ubeda, 339 Corcega street (top of Pau Claris/Passeig de gracia) http://www.ubedagintapas.com they serve mini dishes in tiny pans, which are delicious too! Another great find is Los Caracoles, although a bit expensivo, a very traditional restaurant since the 1800 or there abouts. If you want some cocktails and perhaps a lamb dinner and a lovely view go to the Asador de Aranda in Avda Tibidabo, it is up a hill but worth the walk. Then stroll over to Mirablau’ for a cocktail later! As you can see food is a passion! :) Hope you will find this useful and have fabulous time in my hometown! Tell us all your adventures once you’re back!